Yeah, quick and easy is my thing, and guess what? TAMALES ARE QUICK AND EASY! Well, not quick-quick, but quick-do-something-else-while-you-wait-quick. Believe it or not, I keep a package of corn husks and a bag of masa harina in my pantry. I know, you’d be more likely to expect instant rice and Velveeta, but no. 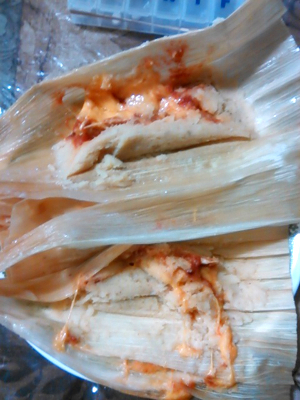 You can fill tamales with all kindsa stuff. I filled these with Meatless Griller Strips, salsa, and cheese. Okay, soak the corn husks in warmish water for a few minutes, then drain. Meanwhile, mix the masa harina into tamale dough according to package directions. I don’t use lard, so I used Smart Balance Organic Buttery Spread. Spread a lump of the dough onto a corn husk. Put on some salsa, some warmed griller strips, cheese, maybe some beans and/or rice. Not too much. Wrap the corn husk around it all and fold down the ends or tie them off. Put the corn husk packets in the top of a double boiler or a steamer with the water just barely simmering and steaming. Dampen a cloth and put that over the top of the packets. You can serve these with more salsa, taco or enchilada sauce, melted cheese, as you like it. Yeah, they kinda leaked, but, as my Grandpa used to say, it don’t hurt the eatin’ of it. A WRITING PROMPT FOR YOU: A character is surprised when a project turns out to be much easier than expected. This entry was posted in Food. Tagged ethnic food, Mexican food, tamales. It’s good to see you participating for the A to Z Challenge. I look forward to reading your posts during April. Oh, tamales are delicious and delightful! Even the ones that come in a can are pretty good, but fresh ones are stellar! looks yummy. do you use corn husk. if i dont have corn husk what other wrapper can i use except plastic. Looking online, I find these suggestions: 1. Buy corn in the husk, pull off the husks, and dry them in a 100F oven until they’re … you know … dry. 2. banana leaves 3. cabbage leaves 4. parchment paper 5. aluminum foil. Naturally, whatever you use will give the tamale a different flavor or non-flavor. thank you i use some banana leave and it has some aromatic smell that i like. If I had access to banana leaves, I would definitely try that! I love tamales, thanks for this wonderful guide. Can’t wait to make some then eat them during movie marathons.